Way back in my childhood I remember my father, who is a Londoner, talking about the Smog’s that they used to have. These ‘pea soupers’ basically rendered the capital incapacitated until they cleared. These were the result of the location of London combined with vast amounts of pollution from open fires and industry and not only did people struggle to move around in them, they were killers too. 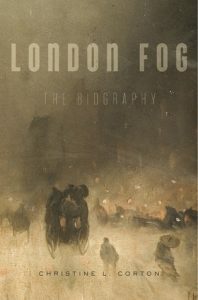 The fog held in suspension poisoned the population, provided cover for crime and other nefarious activities and caused all manner of accidents on the days that they existed. They were last seen in the 1960’s after the government of the day finally passed and enforced the Clean Air Act. 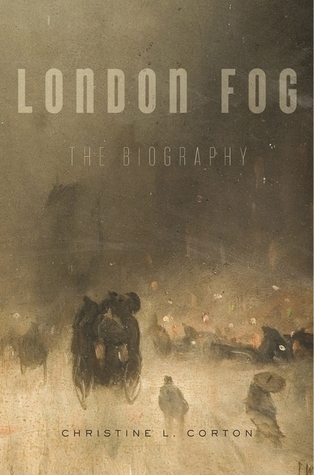 London became known as the City of Fog and this seeped into the art and literature. This book just on this weather phenomena, Corton peers through the gloom to bring us the stories from history, excerpts from writers such as T. S. Eliot, Robert Louis Stevenson and of course Charles Dickens. There are a large number of artworks, cartoon and photographs included in the book adding to the atmosphere. The photos are particularly poignant as they really show just how bad it was to live through. The research that has gone into this is extensive, as the 60 odd pages of notes attest. Occasionally the prose could be a little dry and academical, but there was normally something interesting along out of the murk to pique your interest once again.